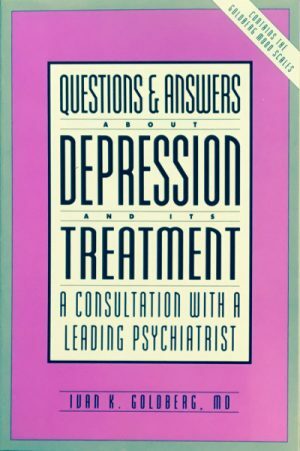 In this highly acclaimed book, Dr. Goldberg, an eminent psychiatrist known worldwide for his work in the treatment of depression, provides short, easy-to-understand answers to more than 300 of the most frequently asked questions about depression, manic depression and related mood disorders. A “must-have” book for patients and their families who want to become educated about depression. For readers who suspect they may have a mood disorder, the self-administered questionnaires will help them decide whether to schedule a psychiatric evaluation. This handy reference includes all of the most current information about drugs, diagnostic methods and treatment options. "Everyone who suffers from depression or who cares about someone who is depressed must read this book." "Detailed and up-to-date, this book includes discussions of children, the elderly, the grief process, suicide and many other topics."